Is chronic pain keeping you from enjoying your favorite activities? We are pleased to offer a highly effective solution. 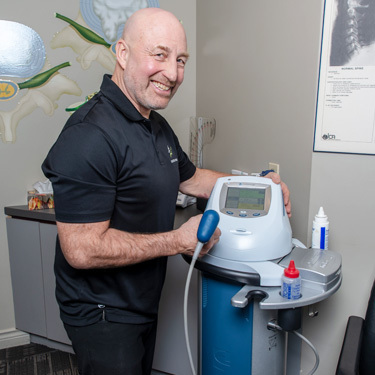 Shockwave therapy is a cutting-edge modality that’s particularly helpful for tendon injuries or trigger points that aren’t resolving. Shockwave therapy involves the use of short, frequent and high-intensity percussions into injured soft tissue. The therapy reduces pain, increases function and jump-starts the healing process. Your shockwave session will be separate from an appointment for a chiropractic adjustment. Dr. Davidson prefers to keep the session separate from chiropractic so he can see how you respond to the therapy. To administer shockwave therapy, Dr. Davidson will apply a lubricating gel to the shockwave therapy wand and then place the wand against your skin over the area that’s been injured. After the wand is activated, acoustic waves are transmitted through the skin to the damaged tissue. When the injured tissue gets stimulated, the body is encouraged to deliver nutrients and blood to the area. You will experience an increase in the flow of oxygenated blood. As a result, the body’s innate ability to heal will be accelerated. Shockwave therapy isn’t painful, but you may experience some discomfort and tenderness. To get results, most patients will typically require 4-6 sessions. We schedule the sessions a week apart as the body needs time to heal after each course. Does insurance cover shockwave therapy? Insurance partially covers the therapy but not all of it. You don’t have to put up with chronic pain that’s preventing you from living your best life. 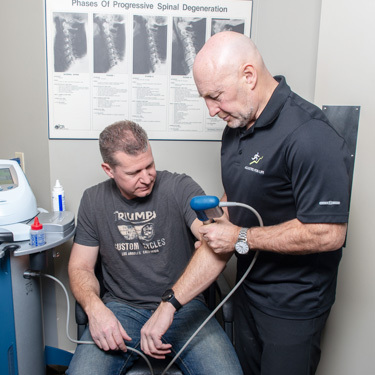 Contact Adjusted For Life Chiropractic Health Centre today to schedule a shockwave therapy Calgary session!